For the second time, Martha Baillie will present the European Book Club. 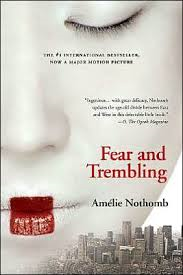 The book that has been chosen for this second edition is “Fear and Trembling”, written by Beligian author Amélie Nothomb. Fear and Trembling Summary: According to ancient Japanese protocol, foreigners deigning to approach the emperor did so only with fear and trembling. Terror and self-abasement conveyed respect. Amélie, our well-intentioned and eager young Western heroine, goes to Japan to spend a year working at the Yumimoto Corporation. Returning to the land where she was born is the fulfillment of a dream for Amélie; working there turns into comic nightmare.